Throughout history there have people with gifts of healing that defy explanation and go beyond the realm of being readily understood. As a child Tina Payne, Spiritual Master, Ultra Intuitive Business and Life Coach, felt these gifts and they grew stronger over time. Tina had the ability to sense and know the manner in which people needed to be assisted on their road to recover from emotional trauma or finding a path to success in relationships, business and more. Tina Payne, raised in religious family in Southern California, masked her gifts as a youngster in order to fit with other children, however, it was readily apparent to her father what was going on with his daughter. He knew without having to be told and accepted it as part of who and what Tina is and would be all her life. 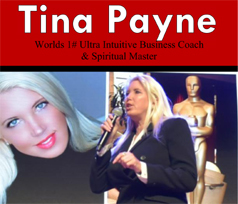 Through speeches, seminars, one-on-one coaching, online broadcasts, books and articles Tina Payne brings comfort, faith, healing and direction to people around the world. But that is only part of the story, her business acumen and success, when combined with her spiritual gifts, allows her intuitive insight to guide people starting or running existing businesses, marketing their products and more. Tina Payne's calm knowing that her advice comes from a higher power is vital as those taking her advice see and feel her power and love. One must experience Tina Payne to fully know who truly special she is!